The Songmics Bamboo Laundry Hamper is a great method for organizing laundry mess and other trivial stuffs. It simplifies your house working and keeps your home environment clean and tidy. 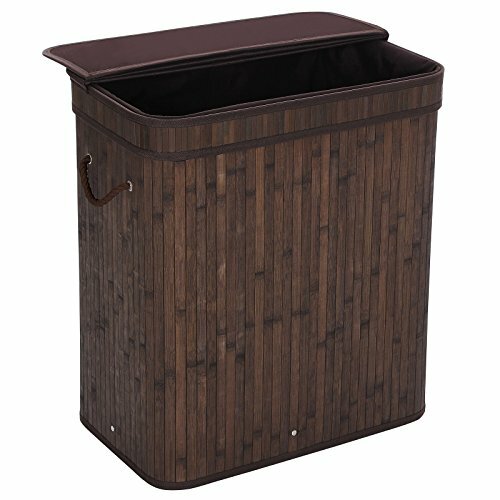 Crafted from Natural Bamboo and colored by classic Dark Brown, it impressively enhances the stylish feeling of your home décor. The thickened lid and strengthened bottom makes the whole constructure sturdier and more stable. Also the simple design makes it easy to be assembled and space-saving when folded flat. 5. Put on the lid. Finish and Enjoy! - It can be wiped clean with a damp cloth.